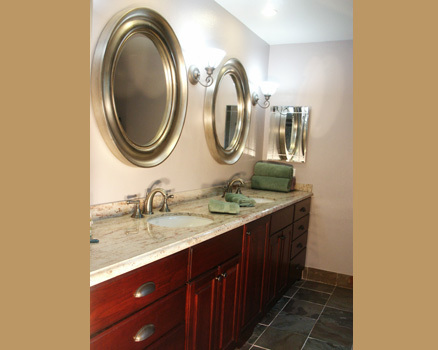 In this master bathroom, the standard track home cabinets, wall mirror and shower are replaced with new burgundy cabinets to complement the bedroom furniture. New mirrors are placed between new wall sconces, with medicine cabinets recessed in either end wall. The shower/tub was totally demolished to create a large walk-in shower with a seat. New slate and glass tiles blend the earthiness of the slate with the sparkle of colored glass. New rain shower head is augmented with a hand shower. A new frameless shower enclosure blends in so the slate walls can be enjoyed.